Mobile Charging Stations (BS-MCS) store large volumes of laptops, tablets, and other mobile computing equipment while routing charging cables neatly to each unit. They are ideal for schools, libraries, and IT departments that regularly check out laptops to students or members of the public. At the warehouse, the BS-MCS safely stores rugged tablets for distributed computing applications. 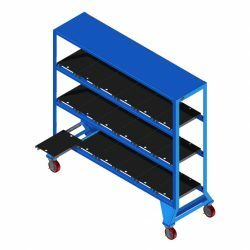 These units roll easily on brake-enabled phenolic casters (optional). Integrated routing channels keep charging cables neatly organized, preventing accidental damage and tripping risks. Each individual computer platform slides out for easy access, and slides back into the frame. This narrow stand has a minimal footprint, allowing storage for large collections of devices without sacrificing valuable floorspace. The BS-MCS is durable enough for harsh industrial environments, with a welded steel frame and a chemical-resistant powder coating. At the same time, it is easy enough for anyone to move and operate. Standard units store up to 18 devices on three shelves, each with six laptop trays arranged side by side. Custom designs are also available to meet any storage need or space requirement. Call the BHS sales team at +1 314 423 2075 to learn more about Mobile Charging Stations and other industrial storage solutions.